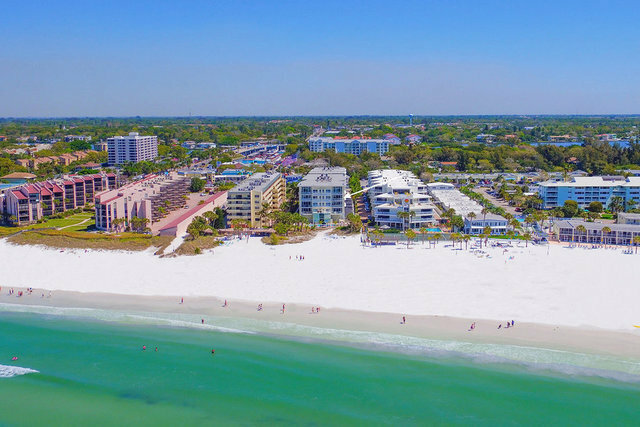 Savor the panoramic, azure Gulf of Mexico views and the silky white sands of world-famous Siesta Beach from this spectacular Gulf-front Siesta Key condo with a desirable South-West location. High ceilings and abundant natural light complement this stylish, furnished retreat offering custom upgrades and soft, contemporary neutral decor in an open floor plan with bamboo and tile floors. A Poggenpohl chef's kitchen with custom cabinetry and granite countertops opens to the living room, featuring a Bose audio system. Glass sliders lead to a covered 10' x 17' terrace with full beach views through no-barrier glass railings and summer kitchen. The spacious owner's suite with upscale master bath, full Gulf views and sliders direct to lanai to bask in balmy Gulf breezes. Guest suite with private bath, convenient Murphy bed in third bedroom/office, interior laundry room. Two covered parking spaces next to the elevator, storage for water toys and bikes. The ultimate in maintenance-free living, Crescent Siesta Key is a gated, boutique enclave of 26 beach residences built in 2006 with the highest standards and luxury finishes. Fitness room, two heated pools (one beach-front with spa), summer kitchens and social room for entertaining, handicapped accessible and pet-friendly. Perfect for a permanent residence or a vacation home, you'll never tire of the spectacular Gulf views and blazing Siesta Key sunsets. Excellent rental history, located within easy access to the mainland and all that urban Sarasota has to offer.